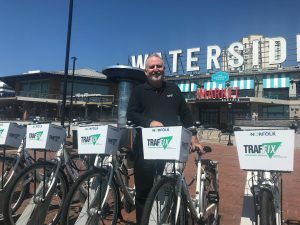 TRAFFIX, in partnership with the City of Norfolk, Pace bike share, and five other sponsors, launched Hampton Roads’ first bike share program today, providing a convenient and healthy way to get around Norfolk. The program offers anyone an easy way to move around downtown Norfolk, make transit connections, and enjoy the sites and sounds of the city – all with an easy-to-use smart phone app. The city has purchased 250 bikes and placed them throughout the central business district and north of downtown to give people an opportunity to enjoy the city at a minimal cost. TRAFFIX is one of the six main sponsors of the bike share program and is committed to it for three years. Its designated bike station is at the ferry dock at Waterside District. As a sponsor, TRAFFIX will have its logo on the ferry dock station signage, bike baskets, and the Pace Norfolk bike share app. The program does not cost the public money because of the sponsorships.